Arthur Opp weighs 550 pounds and hasn’t left his rambling Brooklyn home in a decade. Twenty miles away, in Yonkers, seventeen-year-old Kel Keller navigates life as the poor kid in a rich school and pins his hopes on what seems like a promising baseball career—if he can untangle himself from his difficult family life. The link between this unlikely pair is Kel’s mother, Charlene, a former student of Arthur’s. After nearly two decades of silence, it is Charlene’s unexpected phone call to Arthur—a plea for help—that shatters their isolation. 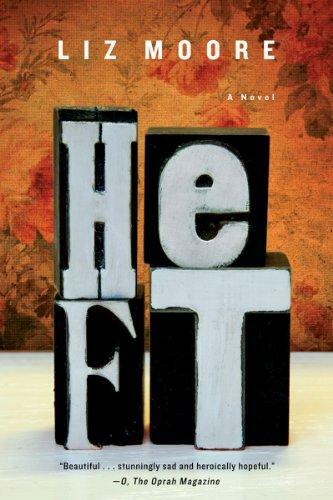 Told with warmth and intelligence through Arthur and Kel’s own quirky and lovable voices, Heft is the story of two improbable heroes whose connection transforms both their lives. It is a memorable, heartbreaking, and ultimately redemptive novel about finding sustenance and friendship in the most surprising places. Liz Moore is a writer and musician. Her debut novel, The Words of Every Song, was published in 2007, and she recently released her album Backyards. She is a professor at Holy Family University in Philadelphia, where she lives. Why do you think Arthur has isolated himself? What kind of connection does he want, and does he find it? Is it possible for the characters of Heft to free themselves from the behaviors, the characteristics, and even the physical objects (a house, for instance) they inherit from their parents? Several of the main characters in Heft are outsiders. How does one’s inability to “belong” shape his or her character in the long term? Did the novel reinforce boundaries between different groups? Who appear to be the outsiders in the book? From Charlene to Yolanda to Marty to his neighbor’s wife, Suzanne, Arthur seems more comfortable in the company of women. Why do you think that is? What do you make of these platonic relationships? Why do you think Charlene kept the identity of Kel’s father a secret, even when she knew she was going to die? Do you think Kel will continue to search for his biological father now that he knows Arthur isn’t his? Should he? What are the aspirations of the characters in Heft? When is it important for us to strive for something more, and when do those same impulses become harmful? Why do you think the author chose to tell this story from multiple perspectives? Did it affect how you perceived these characters? What about your impression of the novel as a whole? Both Arthur and Charlene struggle with different types of addiction. Did either of their compulsive behaviors strike you as more dangerous or unacceptable than the other? Is it possible to divide the characters in Heft into those who help others and those who are dependent on others’ help? Are there examples of mutual support, too? Arthur and Kel still have not met at the novel’s close. What do you think will happen between the two of them when they do meet? Are you optimistic about their futures? Read “Connecting to Loneliness” by Reading Group Choices' Neely Kennedy for discussible topics and themes!